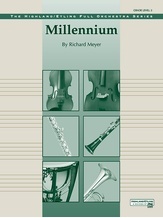 "Millennium," recorded this year by Alfred for the first time, was first released in 1998. Winner of the 1998 N.S.O.A. composition contest, this contemporary-sounding overture is extremely powerful and full of emotion from beginning to end. After a foreboding introduction, the heroic main theme is introduced by the brass section in unison, accompanied by the entire orchestra in a percussive, marcato style. A lyrical subordinate theme of extreme beauty follows, first stated by unison cellos, then picked up by the entire orchestra. The third and final section is a wild and energetic march, pitting brass against woodwinds and strings, leading into a final, majestic restatement of the main theme. 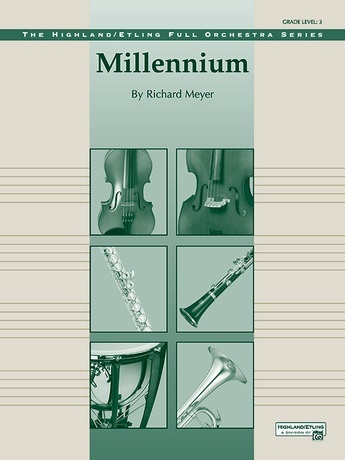 Richard Meyer's colorful and imaginative scoring features every section of the symphony orchestra, resulting in a wonderfully mature-sounding, yet playable, 'tour de force' for the student orchestra.